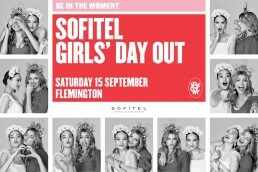 Victoria Racing Club needed a fresh new look for their Sofitel Girls’ Day Out campaign that highlighted the key elements of the day – fun, friendship and a great day out. The concept was called ‘Be In The Moment’, a celebration capturing the moments of happiness and friendship at the races. We shot two models in a series of photo-booth style moments. The campaign fit in well with the ABT campaign while giving Sofitel Girls’ Day Out its own personality and style.